you can view web classes at any time as many times as you wish. Since the classes are web-based, flexible learning is available for each student. Support study and school club activities at the same time by attending classes when the activities are not in session. Periodical exam preparation with intensive attendance before the exams. Adjust monthly academic workload according to the school events. Flexibly change according to school curriculam. Promptly begin studying examination subjects to have a leg up on the competition. Recover the late start for exam preparation via sequential attendance. Think until you are convinced by temporarily stopping the videos. No missing parts as you can rewind to review videos. Improve concentration by viewing 1.4 times or 2 times faster than normal speed to shorten the number of hours. Exclusive teaching staff at Wingnet head office will handle questions and answers. 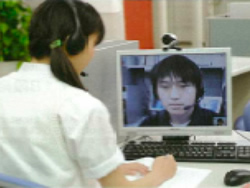 By using web cameras and headsets, we will solve questions while speaking face-to-face. 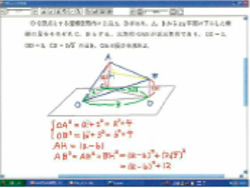 In the Interactive Questioning System, answer papers and educational materials can be shared on the screen with the teaching staff by scanning them. The teaching staff uses pen tablets to write on the PC screen and explain the solution methods for questions as well as important points. If you are connected to printers, you can print out the screens with explanations written. By measuring your current academic ability, you will be able to efficiently develop a learning plan for the future. Through the videos and publications, we will provide valuable information on a timely basis. Copyright © 2018 ICHISHIN HOLDINGS CO., LTD. All Rights Reserved.